R.B. 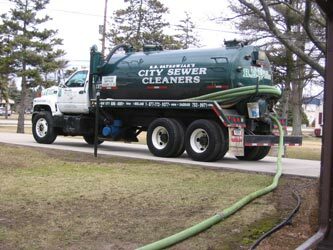 Satkowiak’s City Sewer Cleaners offers complete professional septic solutions including septic tank cleaning, installation and repair, high pressure sewer jetting, augering, and more – all at competitive rates. Owned by R.B. Satkowiak, who has been installing and servicing septic tanks and fields for over 50 years, our business is dedicated to providing prompt septic tank cleaning services, quality workmanship, and satisfaction to our valued residential customers. If you are currently having problems with your septic system, give us a call for a free estimate. DO keep surface water from up-slope or from roof drains away from the disposal field. DO compost your kitchen waste. A garbage grinder should be installed only when the septic tank is over sized, and the tank will need to be pumped more often. DO have your septic tank pumped every 3-5 years. DON’T overload the system with high volumes of water. Don’t connect basement sump pumps to the on-site system. Don’t connect backwash from water treatment devices directly to the on-site system without professional advice. Don’t allow large amounts of fats, chemicals or solvents to enter the system; don’t allow any plastics to enter. DON’T use any septic tank additives. They are not beneficial and may damage your disposal system. Active bacteria are naturally present in sewage. Even with additives, regular pumping of solids is still required. DON’T enter a septic tank without proper ventilation. A second person is required to be present above ground and other requirements by law are met for confined spaces. Sewer gases can be fatal. DON’T allow vehicles or heavy equipment to drive over or park on the disposal field. This may compact the soil and crush the piping. DON’T plant anything over the disposal field except grass. Especially do not cover the tank or field with asphalt or concrete or other impermeable material. DON’T put in a separate pipe to carry wash waters to a side ditch or woods. These “grey-waters” also contain disease- carrying organisms. Above all else- DON’T wait for signs of failure. Check the system regularly.